Launched yesterday, on the 4th anniversary of the US invasion of Iraq, microRevolt's Stitch for Senate is an initiative of knit hobbyists making helmet liners for every United States Senator. The helmet liner pattern was adapted from a support-the-troops initiative for soldiers stationed in Iraq. All the senators will receive their own helmet liner, and Senators can opt to send helmet liners to a soldier once they receive the helmet. Charitable knitting during wartime has been a tradition since the American Revolution. 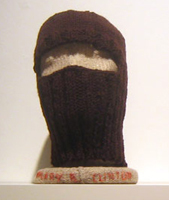 The Stitch for Senate website will compile testimonies from knitters reviving this cultural trend, seeking to understand what knitters express through wartime knitting: charity, allegiance, patriotism, resistance, radicalism, etc. and use the tradition of political organizing within knitting circles as a space for storytelling, discussion, exchange and protest. Other microRevolt news: Save the date for the Nike Blanket Petition workshop at the Museum of Arts and Design, NYC, MAY 12. Radical Lace and Subversive Knitting exhibit is on view Jan 25 - June 12, 2007 at Museum of Arts and Design, New York, NY; and Gender Stitchery at Carleton College Art Gallery in Northfield, MN, March 30 - May 6, 2007.